while helping out the community. 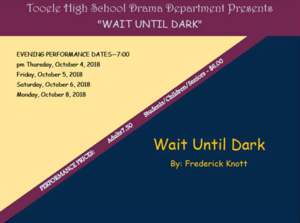 Tooele High Drama presents "Wait Until Dark"! There will be a school-wide practice ACT on October 2nd. Students will test in their 6th hour class and then have 20 minute classes after a lunch break (full schedule below).